Heel spurs are a common reason for people to visit their podiatrist serving Scottsdale. These small calcium deposits can cause major pain, but treatments are available to relieve your symptoms. Heel spurs grow along the plantar fascia and create a sensation similar to that of a pebble being stuck in your shoe. Your podiatrist will use a physical exam plus X-rays to determine if a heel spur is the cause of your foot pain before beginning treatment. If you do have a heel spur, your podiatrist may recommend a cortisone injection to ease inflammation. 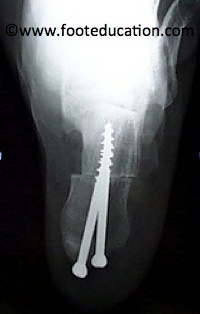 Other techniques, such as stretching the calf muscles, treating the heel with ice, and wearing a custom orthotic may also provide relief from the discomfort of a heel spur. Heel spurs develop in some people that have a condition called plantar fasciitis, inflammation of the plantar fascia. Heel spurs form when the plantar fascia separates from the calcaneus. An abnormal bone growth, a hook-like spur, forms from calcium deposits that grow at the site of inflammation. Heel spurs are more common in middle-aged adults and people that have had plantar fasciitis for a long time. People with flat feet or high arches are vulnerable to heel spurs. Women who wear high-heeled shoes are more susceptible, as well.